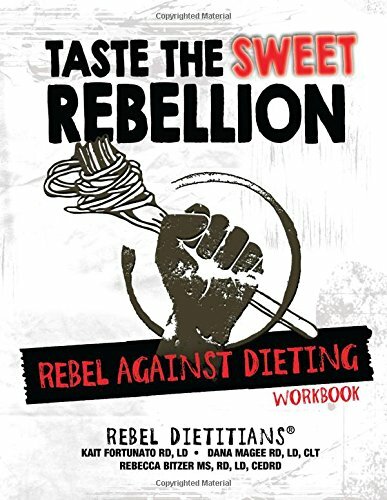 iaedp members Kait Fortunato, RD, LD, CEDRD, Rebecca Bitzer, MS, RD/LD, CEDRD, and colleague Dana Magee RD, LD, CLT published a workbook “Taste the Sweet Rebellion: REBEL Against Dieting Workbook”. The REBEL Against Dieting Workbook contains an evidenced based nutritional approach to achieve health and happiness. The REBEL approach incorporates elements of Intuitive Eating and Mindful Eating for those looking to improve their health and nutrition. The REBEL Dietitians put their own creative, practical, and individualized spin on the research and created this workbook to help clients break free from diet prison once and for all. We feel nutrition is very important, but it is not the only key to happiness and only deserves a small space in your everyday life. We can help you to put food back in its place leaving room to better your relationships, stress levels, and fun in your life.